I spend a lot of time on Pinterest. More than I should. It has mostly taken the place of StumbleUpon for me in recent years. My boyfriend and I joke that anything “cool” I say I saw obviously came from Pinterest. We’ve started to say that I see this stuff at my best friend’s house, just to make it sound like I don’t look at Pinterest for many hours on end. It’s fun to pretend to have friends. Yay! While we say it in jest, I imagine there’s a bit of pity behind it all. That’s okay. Nevertheless, I’ve still seen some things on Pinterest that have interested me. Something I saw recently that inspired me to try it myself was this String Art pin from the blog A Beautiful Mess. So, I dove in. I’m not much of a crafter. I usually stick to pencils, paint, markers, etc. Scissors have always been cruel to me. That was still the case when I started this project. Does blood bother you? Well, too bad. 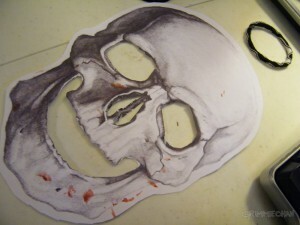 The skull decided that it was necessary I shed some blood to appease the crafting gods. Did I stop and tend to this cut while doing this project? Of course not. AIN’T NOBODY GOT TIME FOR THAT. The crafting must go on. I followed the directions from A Beautiful Mess and used some rusty old nails that my boyfriend had left out in the rain. I’m not one to go out and buy new stuff for a project. In fact, the board I used was some scrap wood from an entertainment center that my boyfriend build last year. I didn’t bother cleaning up the paint. 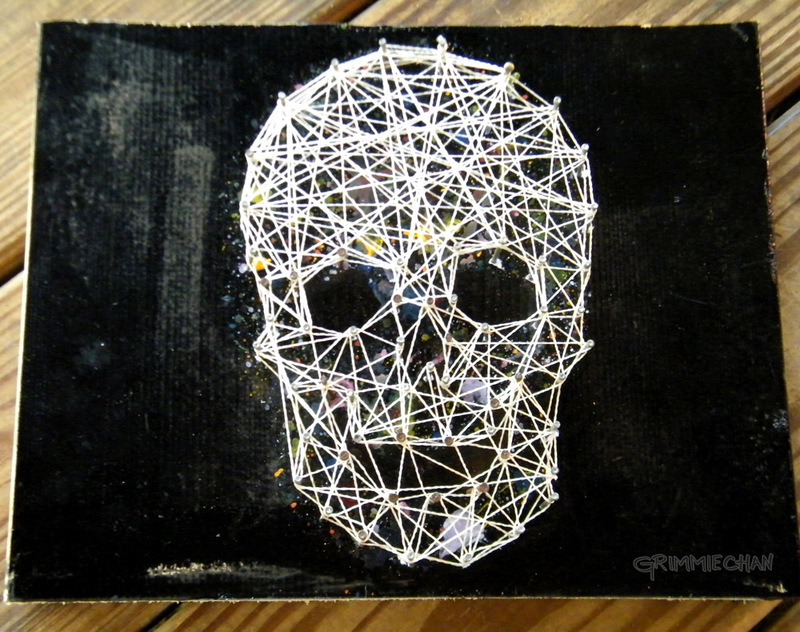 Let’s call this a rustic skull string art project. I spattered some paint behind the strings, but it’s not obvious. This plank of wood is also a lot smaller than the one used in the example. I learned that small scale string art can be…well, let’s just say annoying. It kept me entertained though, so I imagine that made it worth it. I like it well enough. I’m open to suggestions on how to do string art better though. I had a problem with unraveling the string as I went along and having to redo some areas. Ah well, perhaps next time I can make some improvements.